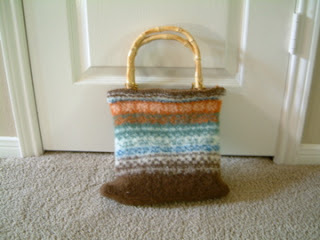 Just another knitter's blog. And some bits and pieces about felting, spinning and leaving TX to Kyoto, Japan. Blogging and registering to Ravelry looked like , at least for me, come hand in hand. This pair means you want to be "active" in knitting/crocheting world. 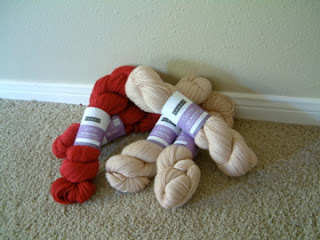 Anyway, I got my invitation to Ravelry. My username there is chicain. I thought I would register under the same name as I use here, but I was a little too excited when I got the invitation that I totally forgot that. Uh-oh. I thought of re-registering with "O'chica", but that means I have to wait another month to use it to organize my knitting stuff. I am not that patient. So, I got kinda double identity in knitting world already. I managed to remember to use same picture in profile for here and Rivelry. That would help someone to recognize me enough. I live in a rental house. The landlord is very nice, beautiful couple who live one mile from us and we have a very good relationship, to say at least. This year, I planned to knit a pair of socks for each of them, Mr. and Mrs. landlord. He loves fishing and she often stays up late to study (she is in a graduate school to be a school psychiatrist), what else fits them better than wool socks? She looks to fit in any size M garment for women, but he is a tall guy. I didn't want take a risk of guessing his size and ending up too small. So, I asked their shoe size when he came to fix (well, replace) my garbage disposal in the kitchen. Thank goodness I asked! It was about one inch larger than my first guess. Problem is, now I made it official by asking their size to knit socks for them, I have to FINISH them. BEFORE we go back to Japan on holidays. So, I chose this yarn. Nice, SPORT WEIGHT, machine washable & dryable yarn. Gems sport( 100% Merino) from louet. 100g/225 yards. My sock pattern is pretty simple. One cable on each side (to keep track on row counting), K2P2 rib on instep and all along leg for better fit. I like to make it toe up because that's the way I made my first pair for adult, not a bootie, but after I made a few cuff down pairs, I am pretty confortable with both ways. I prefer short-row toe&heel. This time, though, I use round toe for HIS pair. (I haven't made my mind how HER pair is going to be in detail.) Usually, I use circular needles, either 2 circs or magic-loop method, to make my socks. This time, because I want to work cables in the middle of a needle, I want to start the round from somewhere between side-center and back-(or front-)center, which means starting short-row toe with provisional CO is incovenient for me. Well, I can manage but I don't like moving the beginning of a round more than a few stitches. I am not afraid of DPNs, so, using DPNs and trying round toe looks confortable. I started HIS pair 2 weeks ago, one sock done in about 10 days. It required some trial and errors, so, second one can be done quicker. HER pair should be a breeze after HIS pair. So I hope. 2. doesn't want more socks than I can manage to knit for him. 4. can laugh with me when something goes funny. I mean, like overfelting or too-much dropping the drop spindle while learning to spin. Or, overgrown sock knit without swatching. Of course he is picky about designs and colors of his garments, but, after all, he is just a man. I am OK to accept his tastes (I mean, narrowness of it) as long as I can knit happily. Meet me as a knitter on Ravelry. Time has gotten away from me.